I had the weirdest experience last week. I posted a recipe for cabbage slaw with pine nuts, ate the dish and really enjoyed it. Two days later I suddenly realized that everything I ate tasted bitter. It seemed to get progressively worse and at first I thought that maybe it was my lipstick or skincare that was causing the problem. So I did the logical thing, I googled “bitter taste in my mouth.” and self-diagnosed myself. Not the smartest thing I know, but who doesn’t turn to the internet to determine they aren’t having a stroke or developimg a strange form of cancer? It turns out it wasn’t anything that exotic but it would appear that I have a case of pine nut syndrome. Sufferers report a constant bitter or metallic taste as a result of eating pine nuts. It usually occurs 12 to 72 hours after consumption and can occur in those that have had pine nuts before with no adverse reaction. It isn’t an allergy and there is still no definitive cause. I have to admit the experience put me into a panic. I tried to make dinner the first night and had to have someone else taste it for me because everything tasted awful. I guess if you are looking to jump start a diet eating pine nuts might be a way to go. I found that I definitely lost my appetite for a few days since everything I tasted made me feel like I had just washed my mouth out with soap. The symptoms typically last for a few days or up to a month and it seems to finally be abating after a week or so. I hate to say it but I think I’m off pine nuts forever. So if I ever do make the slaw again, I’m thinking that I’ll sub in hazelnuts instead. Luckily I made these bowls before the whole pine nut debacle so I can attest to how delicious they are. Tofu is something that I have never really enjoyed much. Growing up my mother ate tofu on a daily basis and it’s one of the few things that I never really got into. These days I don’t mind it if it’s baked but I still wouldn’t put it at the top of my favorites list. 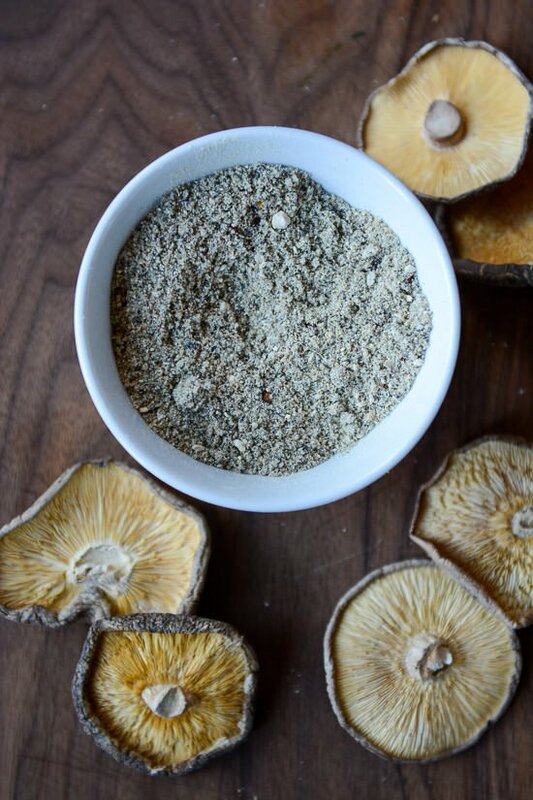 A while back I picked up a container of porcini powder from my butcher and have been loving the savory flavor it adds to dishes. It makes a great base for a vegetarian stock, folded into pasta sauces or added to veggies before roasting. It occurred to me that if porcini would work why not try it with my favorite shiitake mushrooms as well? Dried shitake mushrooms are dirt cheap at my local Asian market so I always have a bag of them in my pantry. I decided to combine them with some black sesame seeds for and added nutty note to the powder. I can’t tell you how much I love this stuff, it adds a savory depth of flavor that really makes the tofu taste like meat. 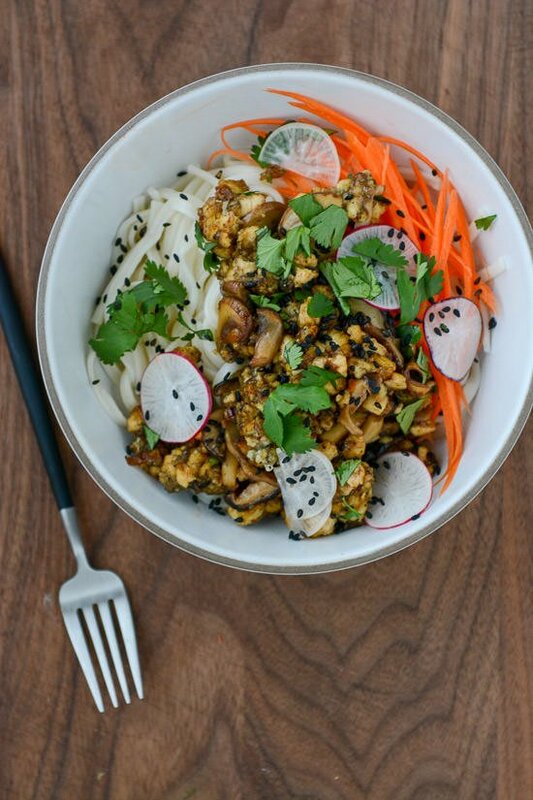 It does take a little bit of forethought to drain the tofu before you can cook it but you could press it the night before and just park it in the fridge until you are ready to cook. The rest of the dish comes together in about 20 minutes so it’s perfect for nights when you don’t have a lot of time to cook. The mushroom powder will keep in the pantry for a month or two but the flavors will dull a bit the longer it sits. 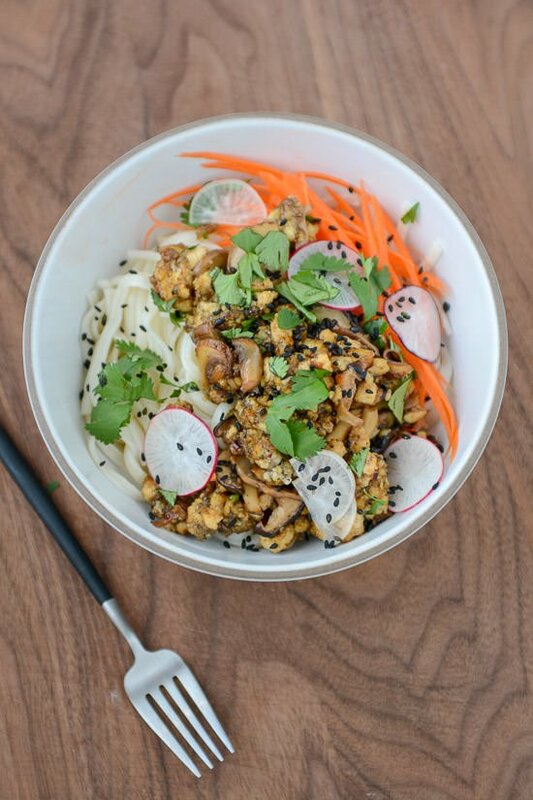 I hope you give this one a try, especially if you aren’t a big tofu fan. If you make this dish I’d love to hear what you think. Post a comment, or post a pic and tag it #scalingback on Instagram! 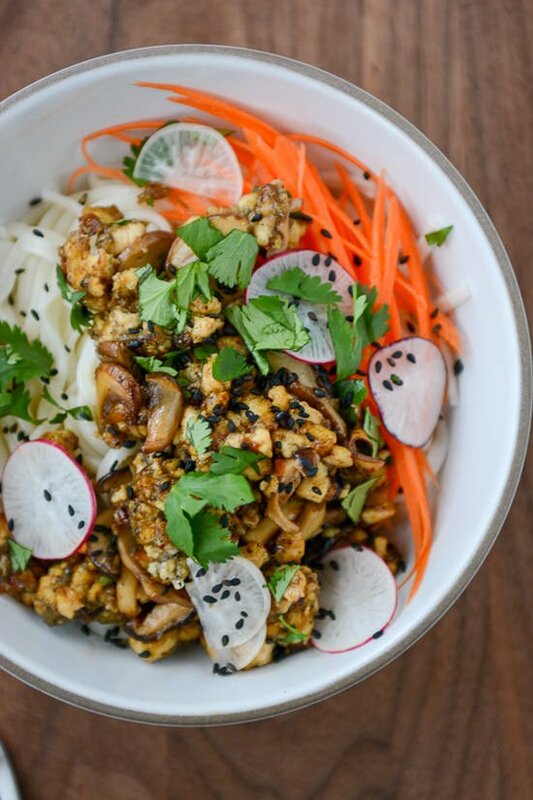 This is the meatiest tasting vegan bowl you'll ever eat. 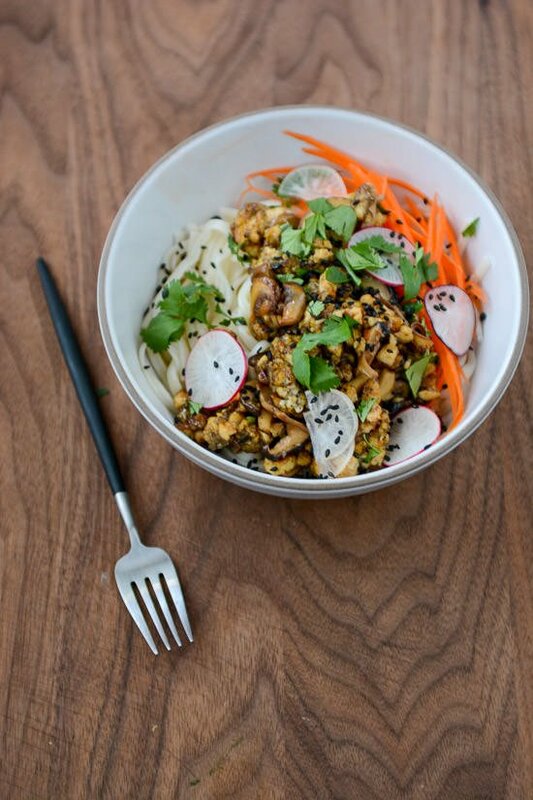 The tofu tastes like ground pork thanks to a coating of powdered shiitake mushrooms and black sesame seeds. Arrange tofu in a single layer on a paper towel-lined plate and cover with a few more paper towels. Place another plate on top and a heavy weight (like a saucepan filled with water or a few cans of beans from your pantry) and let sit for 15-30 minutes to drain any excess liquid. To make the shitake sesame powder place the mushrooms and sesame seeds into a spice grinder and process until they form a fine powder. While the tofu drains prepare the carrot salad. 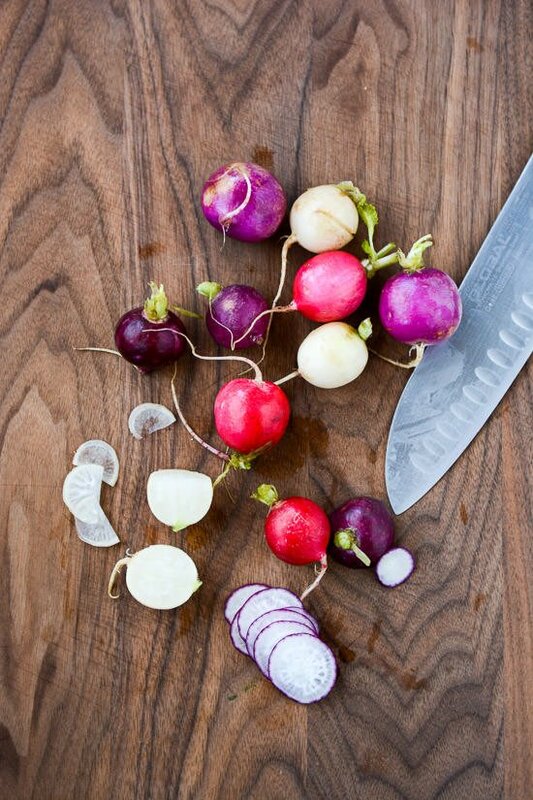 Using a julienne peeler slice one carrot into thin strips and toss with ½ teaspoon sugar, salt, and the rice vinegar. 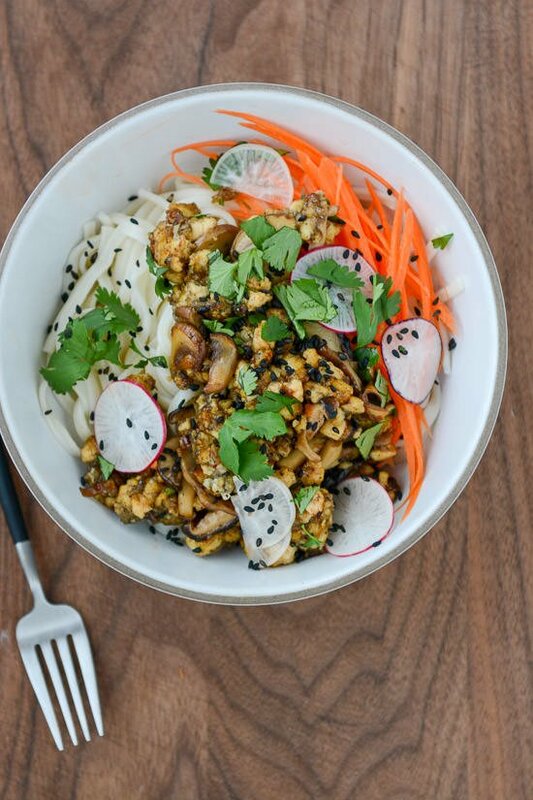 Once the tofu drains, crumble the tofu into a medium bowl and toss with arrowroot starch and 3 tablespoons of the mushroom powder. Heat a tablespoon of olive oil in a wok or large skillet over high heat until the oil starts to shimmer. Add the tofu and cook until it's browned and crispy, stirring occasionally with a wooden spoon. 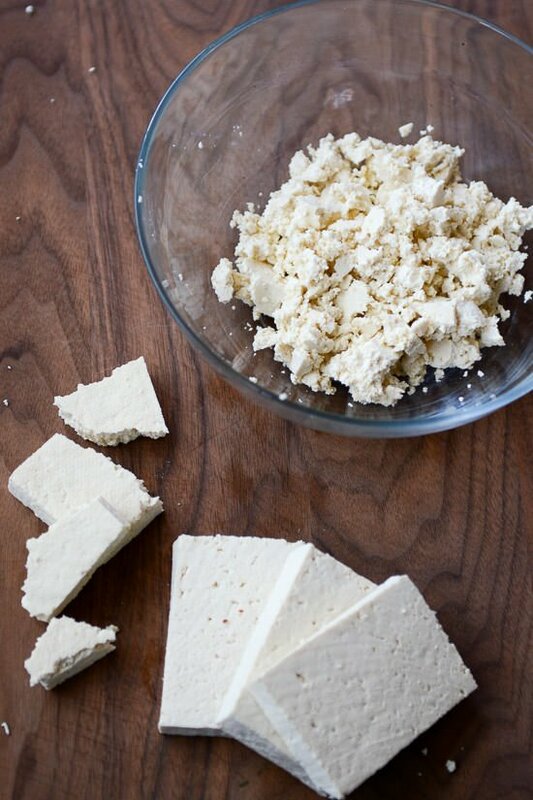 Transfer tofu to a plate. 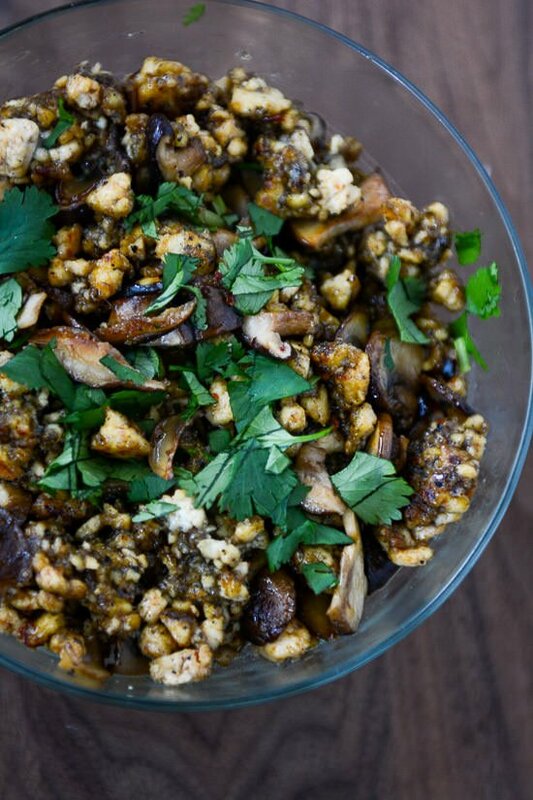 Add the remaining tablespoon of olive oil to the pan along with the sliced mushrooms and garlic and cook until the mushrooms have released all their liquid and start to brown slightly. In a small bowl combine the soy sauce, sesame oil, rice vinegar, and honey, chili paste and stir to combine. Add the tofu to the mushrooms in the pan and pour the sauce over the top. Cook for just a minute or two until everything is coated. 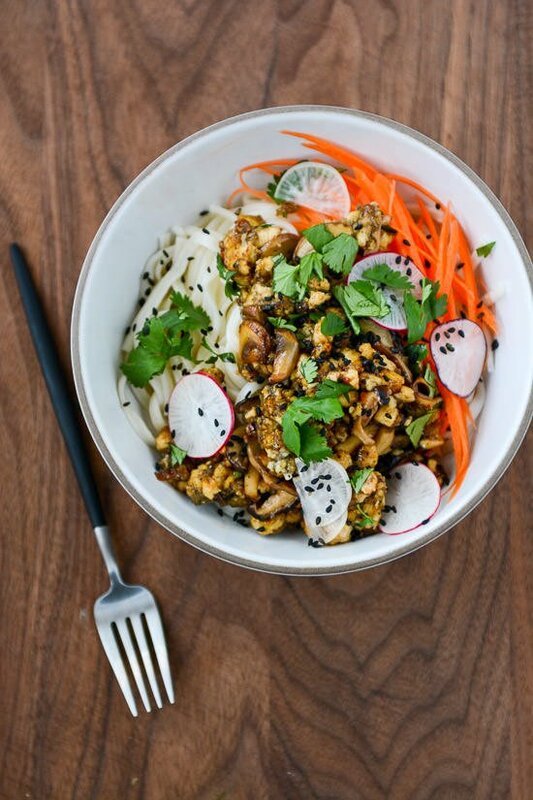 To serve, spoon the tofu mixture over the noodles and top with the carrot salad, sliced radishes, herbs and sprinkle with the sesame seeds.